Reform Elementary recently held their annual spelling bee. There were 28 participants and the bee lasted 8 rounds. Korbit Sommerville spelled the winning word(slobbery). Runners-up were Jalisa Thomas and Jeremiah Cohen. 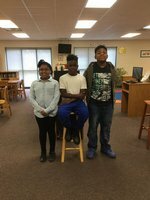 Congratulations to these three students.